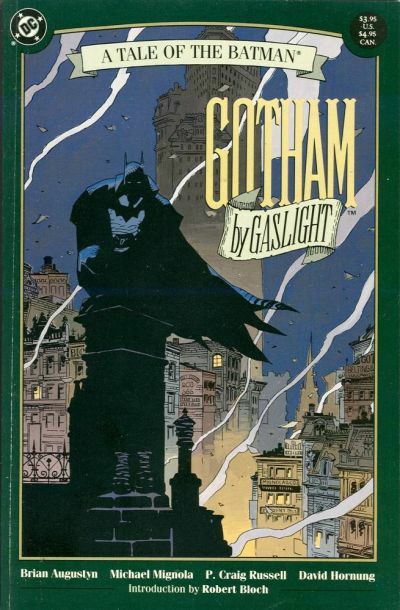 One of my favorite comic books that I repeatedly read as a child was the Batman one-shot “Batman: Gotham by Gaslight.” It was an imaginary story, out of regular DC continuity, that placed Batman in the late nineteenth century. His origin was the same, but this time Gotham City was being plagued by murders committed by the infamous Jack the Ripper. It was written by Brian Augustyn and Mike Mignola, with art by Mignola and inks by P. Craig Russell. And, to top it all off, edited by the preeminent Mark Waid. This was top-notch talent attached to a unique tale. Because of the book’s success in 1989, DC unveiled their Elseworlds imprint, with the first “official” Elseworlds book being “Batman: Holy Terror” in 1991. Written by Alan Brennert and with art by the amazing Norm Breyfogle, this book imagined Batman in a United States that was run as a tyrannical theocracy. Through the years, many other books were released under the Elseworlds banner. Many imaginative yarns were spun: Batman as a Green Lantern, Batman turned into a vampire, Kal-El raised by the Waynes, Batman teaming up with Harry Houdini. The annuals for the regular DC books in 1994 even featured Elseworld stories. One of DC’s greatest books was even under the Elseworlds banner: “Kingdom Come” by Mark Waid and Alex Ross. Since the New 52 began in 2011, there has been no official announcement that the Elseworlds imprint is going to make a comeback anytime soon. DC should bring it back for many reasons, namely for the myriad artistic possibilities inherent in the idea. As a child and young adult, I always looked forward to the newest Elseworlds book. There was such imagination in these stories and the concept was rife with possibility . The characters I loved could be brought to different time periods, could have their origins switched around, and could surprise me in ways that my own imagination could never have thought up itself. Sometimes there were stories I had always wanted to see and was excited when I actually experienced them come to fruition. I was able to see characters in a whole new way and see them used in ways they could never be depicted in regular continuity. These stories were usually just plain fun. Sometimes, like with “Batman: Holy Terror,” my young mind was even enlightened. If for no other reason, for DC, resurrecting Elseworlds would be a wise financial decision. Because the stories are stand-alone (or sometimes miniseries), new readers can be enticed to try out a story with a character they have only seen on film or television. There would be no requirement to know what was going on in DC continuity. Current comic book readers would enjoy great stories riffing on their favorite characters (or ones they never had a previous interest in before) and new readers who have never picked up a comic book could start with an “imaginary” tale before they dipped their feet into the main DC world. The way to entice veteran and novice readers alike would be through the talent involved in the making of these books. They would have to be inventive labors of love for the creators, who must be given free reign to do anything they pleased with these revered characters that have been around for generations. Acclaimed comic book writers and artists who are not usually associated with superhero books could have a chance to flex their muscles with legendary characters such as Batman and even revive characters that are less respected or visible in the DC universe. If any of these books by unconventional talent are successful, the respective writers and artists could eventually segue into the regular universe and given a regular title. This could lead to new blood and inventive stories within the mainstream canon. Creators associated with independent non-superhero books would not be the only ones impacted by Elseworlds. New, untested talent can go wild with characters they would never be allowed to experiment with in the “real” DCU. New writers would, like established independent creators, be able to flex their creative muscles before given the responsibility of writing a top-tier book. DC could discover emerging talents coming out of colleges, or even high schools. By snatching them up and giving them an opportunity to flesh out any idea they wanted in an Elseworlds story, young creators would have a forum to unleash their imaginations and inbred talent. By giving them a chance, these up and coming creators would probably want to stay at a company that gave them creative freedom. If writing superheroes doesn’t pique their interest, they could always bring their unique creations to the Vertigo imprint of DC Comics. Through a new Elseworlds imprint, as with the old, creators could explore themes that are personal to them. Politics, sexuality, gender, religion, and other hot button issues could be explored in these books. There could be books for mature readers only, as well as books for all ages that children and adults could equally enjoy. From serious to fun, there is a myriad of directions that these stories could go and should go if creativity and artistic expression is to be endorsed. Characters, like in the old iteration of Elseworlds, can be placed in strange and unusual genres. There are endless possibilities for where these stories can go because there are no rules or expectations in an Elseworlds yarn. The old motto that emblazoned every Elseworlds books could still apply to the Elseworlds of the 21st century. It was a clarion call to readers for them to pick up an Elseworlds book and stated simply and eloquently that: “In Elseworlds, heroes are taken from their usual settings and put into strange times and places – some that have existed, or might have existed, and others that can’t, couldn’t, or shouldn’t exist. The result is stories that make characters who are as familiar as yesterday seem as fresh as tomorrow.” An imprint with a mission statement such as this truly deserves to be revitalized for a new generation.